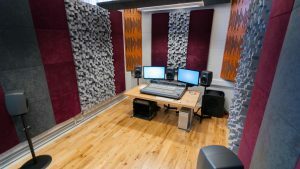 Maynooth University has added a completely new mix room to enhance their impressive music department facilities. The new 5.1 surround system commissioned and installed by Big Bear Sound, features five Genelec 8040B active speakers and a Genelec 7070 sub woofer. An Avid C24 Control Surface and monitor controller and a ProTools HDX system provide the core power. The new mix room compliments the existing recording studio, which now contains Ireland’s first Radar Studio 24 track hard disk system. The new Radar is also capable of running any Windows based Digital Audio Workstation.